Who's A Citizen? The Question Dividing The Island Of Hispaniola : Parallels The Dominican Republic issued a ruling last year that would render stateless many residents of Haitian origin. The government has revised its position, but the fate of many Haitians still isn't clear. 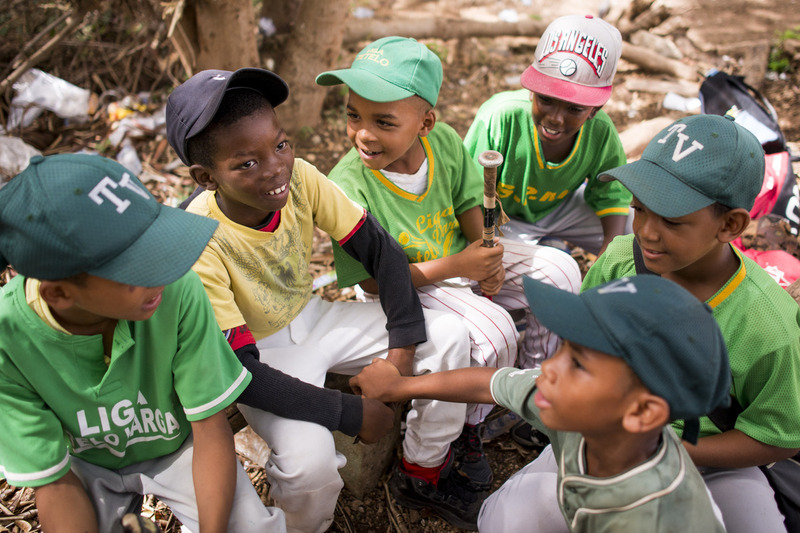 Anderson Desir (second from left) jokes with his teammates at a baseball diamond in San Pedro de Macoris, Dominican Republic. Anderson was born in Haiti, and he and his family are among those who can apply to regularize their status under the new laws. Anderson Desir, 9, shares a dream with many boys his age in the Dominican Republic: He wants to grow up and play baseball in la liga grande, otherwise known as American Major League Baseball. But there's an important difference between Anderson and the 80 Dominican kids from his summer baseball league in San Pedro de Macoris: Anderson is Haitian. In a controversial decision last year, the Dominican Constitutional Court ruled that those born in the country are not citizens unless at least one parent is a legal resident. 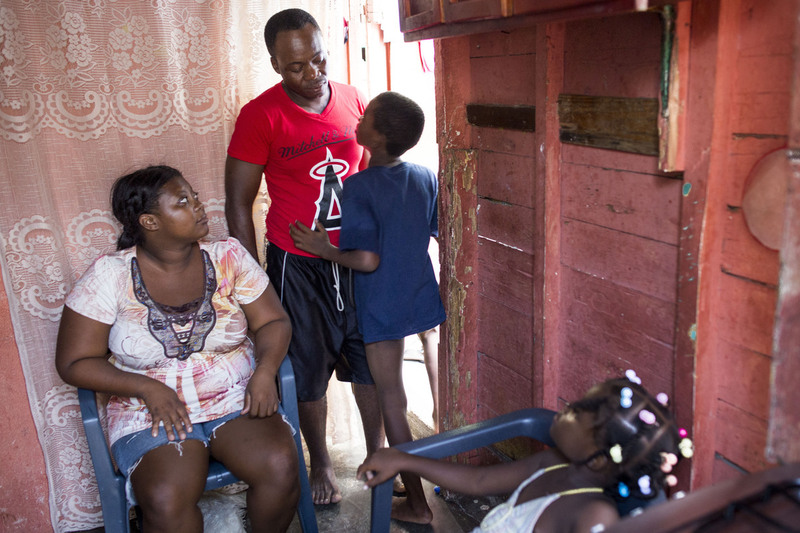 The decision could cause problems for Haitians living in the Dominican Republic, like Anderson, whose parents brought him here from Haiti shortly after he was born. However, the ruling especially affects an estimated 250,000 Haitian descendants born in the Dominican Republic, including Anderson's two siblings — his sister Rosaura, 6, and his brother Mickael, 2. 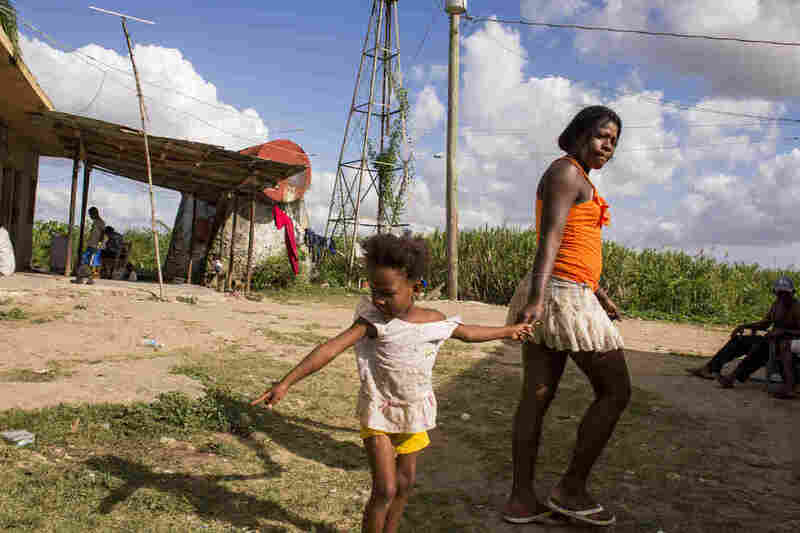 The court's judgment was criticized by the United States, other Latin countries and international human rights advocates, who said the move could create a significant stateless population in the Dominican Republic. In response, Dominican President Danilo Medina signed a law in May that essentially creates two categories of people born in the Dominican Republic to foreign parents: those births that were officially entered into the Civil Registry, and those that were not. The first of the two groups represents a minority of approximately 20,000, who in theory should become "regularized" automatically. However, the vast majority, 200,000 or more in the second group, will be subject to a discretionary application, and would have an uncertain future in the Dominican Republic. Anderson with his parents, Adrienne Jean Pierre and Roudy Desir, and sister, Rosaura Desir, in their home in San Pedro de Macoris. Under a new law, Anderson and his parents fall in one category because they were born in Haiti; his siblings fall in another category because they were born in the Dominican Republic. "For many years, there was a tacit acceptance of Haitian migration, and also the right of descendants to have Dominican nationality," said Bridget Wooding, director of the Observatory of Caribbean Migrants, a think tank in Santo Domingo. "In practice, there's never been a very clear migration legislation, on the one hand. And on the other hand, the rights of descendants born in the Dominican Republic have been shrinking over the years," she added. 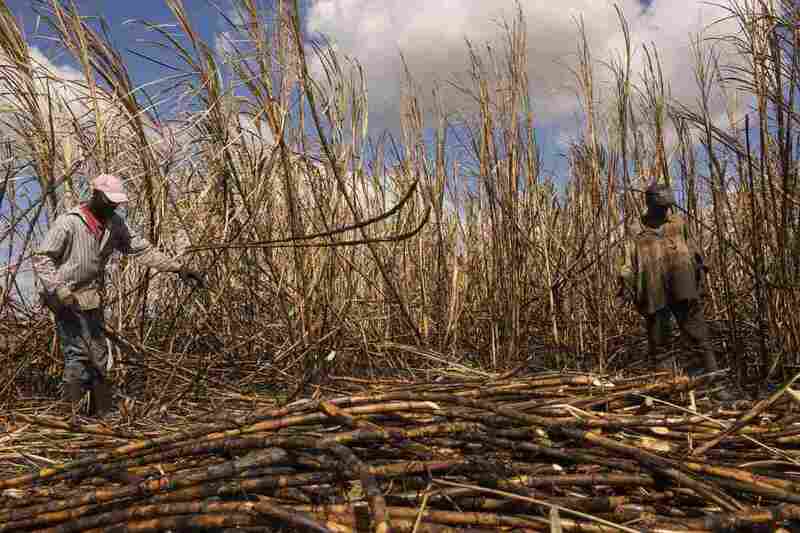 Haitians traditionally moved to the eastern part of the shared island of Hispaniola to work in the sugar cane fields of the Dominican Republic. A mother and child pass through Batey Bembe in the sugar-producing region near the town of Conseulo. Bateys are small, isolated communities made up of sugar cane workers and their families, often consisting of three or four generations. But as that industry has waned, Haitians have become ever more visible as they seek other jobs and opportunities. "This tends to inflame passions," said Wooding. Haitians born in the Dominican Republic have until late October to apply for citizenship under the government's new plan. The first step for someone born in the Dominican Republic is to declare oneself as a foreigner. "The irony here is that these people who are and should be Dominicans by right, due to their birth on the territory (but were not registered, often due to the discrimination of local authorities), will have to claim to be foreigners in the only country they've known," writes Cassandre Theano, an associate legal officer with Open Society Justice Initiative in New York. Applicants must then submit supporting documents of all kinds: pay stubs, letters of employment, rental agreements, proof of homeownership, bank statements, etc. Luis Jacque and Nene Benua of Batey Bembe work side by side in the cane fields near Conseulo. Both arrived in the Dominican Republic from Haiti as teenagers, and have cut cane for the past three decades. But, says Wooding, "we're talking about people who have been undocumented, or have not had regular migration status; people who are in informal work, so they don't have regular work receipts. They don't have the right to own property or open bank accounts, so those kind of criteria are out. People are finding it very difficult." Those who make it this far through the process will be given a two-year temporary visa, after which period they will either be granted or denied regularization status. Theano says the worry is that "once the process is finished and people either don't complete their file or have completed their file and are rejected, then that could pave the way for mass deportation, which, politically is going to be difficult to carry out, but theoretically could happen." The Dominican ambassador to the United States, Aníbal de Castro, draws comparisons between the U.S. and the Dominican Republic in "grappling with the challenges of immigration reform and the complexities of addressing undocumented people living within its borders." A crowd presses up to a document processing window at the Palace of Justice in San Pedro de Macoris. Many of those waiting in line are Haitian nationals requesting background checks, one of the steps required to "regularize" their status in the Dominican Republic. He even suggests that the Dominican Regularization plan "could serve as a road map for the United States and other countries that are facing similar issues." The United States is one of about 30 countries, many of them in the Americas and the Caribbean, that automatically grant citizenship to those born in the country, even if the parents are not legal residents. However, the Dominican constitution of 2010 does not grant that right. Back on the baseball diamond, Anderson's team competes in a tournament on the dusty fields that spawned Sammy Sosa and Robinson Cano, to name only a couple of baseball greats from San Pedro de Macoris. 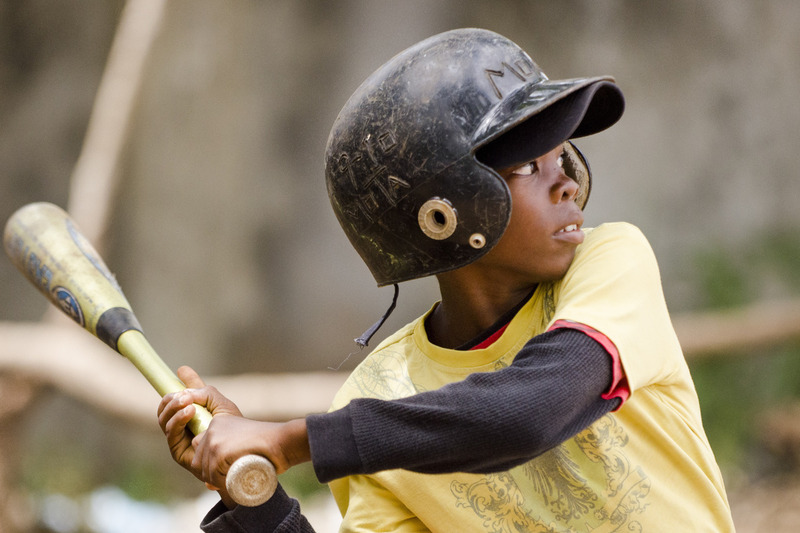 Anderson Desir prepares to swing at a pitch during a tournament in San Pedro de Macoris. If his parents had never come to the Dominican Republic, he would most likely be speaking Haitian Creole and playing soccer somewhere in Haiti. Instead, Anderson's coach calls out the batter's count in quick Dominican Spanish, and the pitcher lobs the ball toward the plate. Anderson swings and makes contact good enough for a solid double, as if he's been doing it his whole life. And, in fact, he has. Although it's only his second week on a team, he's been playing street ball with Dominican neighborhood kids since he could walk. At this point in his baseball career, it's safe to say that, as long as all the paperwork goes through, Anderson is just as likely as any other 9-year-old from San Pedro de Macoris to make it to la liga grande.